On the shores of the Hudson Bay surrounding Churchill, as the polar bears wait for winter's freeze just south of the Arctic Circle, a small number of visitors can visit the realm of the polar bear. Watch these polar bear videos to see what it's like heading out on the tundra to track polar bears from our custom-built Polar Rovers and staying at our specially-outfitted rolling Tundra Lodge. Join us on a soul-stirring journey through the realm of the polar bear as we follow the experiences of Nat Hab guests, Expedition Leaders and a WWF scientist on a trip to Churchill, Manitoba—the Polar Bear Capital of the World. Learn how the power of conservation travel can help protect a threatened species like polar bears for generations to come. Remember when you were young? Did you play outside? Did you explore? Children have an amazing sense of wonder when they're immersed in nature. Most of us tend to lose it as adults. But when you meet the polar bears of Churchill, it comes flooding back. When you watch this short video, you’ll get a feel for the childlike wonder that a polar bear encounter in Churchill offers. 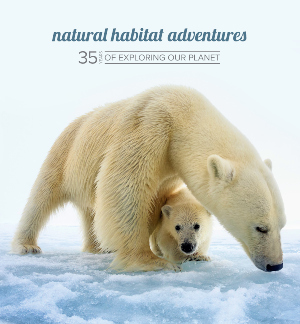 In November 2013, a CNN news crew joined a Nat Hab polar bear photography trip in Churchill. Watch as they encounter their first polar bear on the tundra from one of our giant Polar Rovers. You’ll also hear interviews with NHA Photography Expedition Leader Brad Josephs, who guides many of our polar bear photo tours.